Utah State’s star point guard, Koby McEwen, has received his release from the university and intends to transfer. McEwen, a sophomore who led the Aggies in scoring this season, announced the news via Twitter on Friday evening. A USU spokesman confirmed that both McEwen and guard DeAngelo Isby have received releases and will be leaving the program. McEwen’s transfer comes less than a week after the university announced the hiring of Craig Smith as its new men’s basketball coach. McEwen, the first top-50 recruit to ever sign with the Aggies, had a close connection with fired coach Tim Duryea but especially with one of Duryea’s assistant coaches, Louis Wilson. Wilson was close friends with McEwen’s coach at Wasatch Academy in Mount Pleasant. Earlier this week, Smith said he had begun meeting with his new players individually and expressed hope for keeping McEwen in Logan. “Koby’s certainly one of those guys that will really thrive in our style of play,” Smith said at the time. McEwen was the Mountain West Conference’s freshman of the year in 2017. This season, McEwen was a third-team all-conference selection, averaging 15.6 points, 5.4 rebounds and 3.2 assists per game. 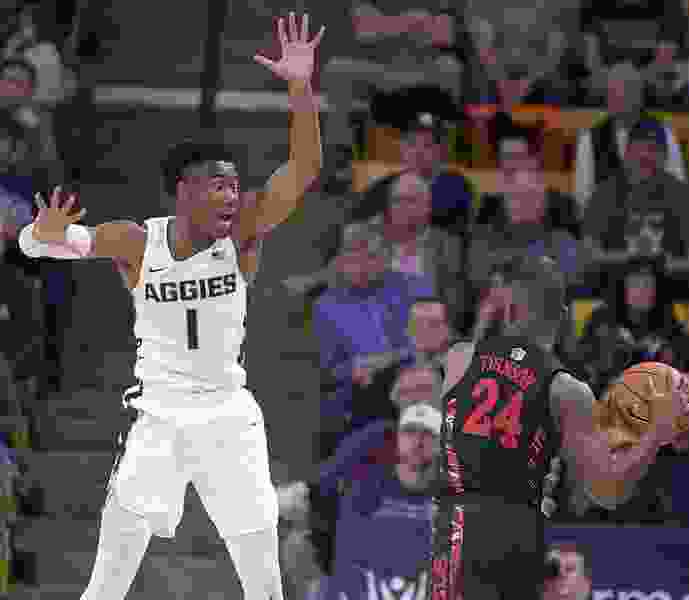 Isby averaged 8.4 points per game last season, his lone campaign as an Aggie.